Amazing how no internet can improve productivity! I have been working on these gorgeous shoes today, in lieu of browsing the internet and generally procrastinating! 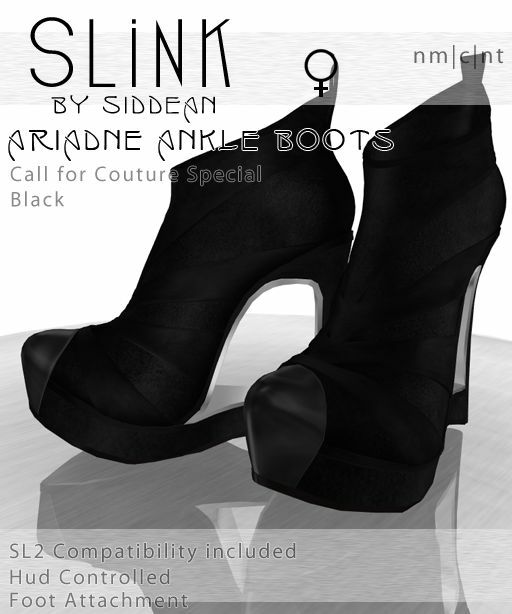 Tabitha, now available in the SLink Mainstore for $300L per pair, fully SL 2 compatible with texture change metals and optional webs. The Tabitha Plateau Pumps are out just in time for Halloween, and I have a special discount for SLink inworld group members – there is a 40% discount on the black, and the tangerine colours of the Tabitha until 12am PST on the 1st of November!! The Tabitha Fatpack is an all-in-one scripted shoe, and the heels and shoe parts can be changed individually for many possible colour combinations! The fatpack is also priced at a cool 50% of the price of the individual colour packs combined. Hey all, I have very limited internet for the next few days while I wait for some technicians to rip up my front yard and replace some 100 year old lead wiring with some nice fast…. I dunno what they will use. Copper? Maybe. Anyway, until then I am tethering on a very limited iPhone modem 3g setup thingamigy. So, that means very, very limited time inworld, and I won’t be as fast responding to customer requests in the meantime. Please be patient with me, it’s beyond my control and I am doing the best I can with what I have. Call for Couture – the bidding has started!! I’m excited to present my contribution to Call for Couture this year. 50% of the proceeds of this charity auction are going to The Samaritans. This limited edition will be one of only 5 in all of SL, and you have until the end of October to place your bid for these great boots! 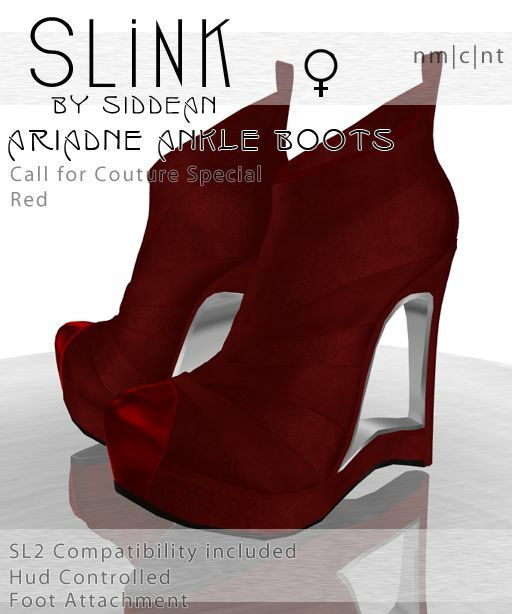 The limited edition of the Ariadne boots is shown above. 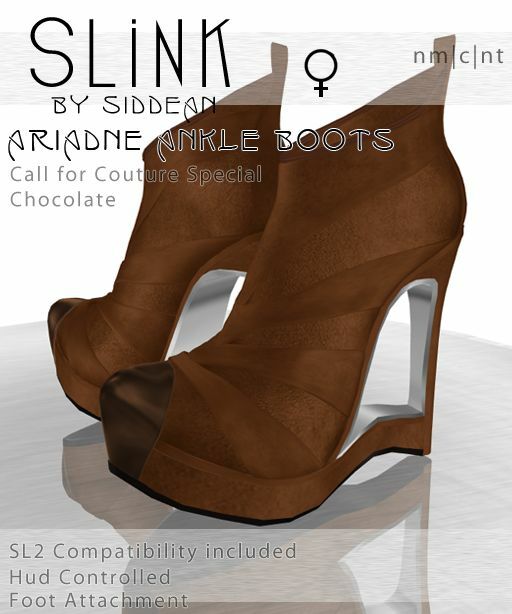 This stunning high heel boot features an open wedge heel in stacked, polished leather, fully HUD controlled with optional invisiprims for those that like to use SL2 compatible viewers, as well as optional matte or patent straps, optional spiderweb and optional studs. These gorgeous boots have many options and come in a very versatile Taupe which will match just about any outfit you can imagine! The pret-a-porter version of these ankle boots, which you can buy for $700L per pair regardless of whether or not you want to bid on the Limited Edition, is featured in red, chocolate and black as shown below. This version comes with matte suede straps and no optional webs or studs. The viewer 2 invisiprim compatibility is available on the HUD, as well as the resizer. I have just popped these cute, mid-heel, maryjane pumps into my subscriber kiosk, *and* sent them out as a gift to my SL group and subscriber group. Very simple, no scripts, separate options for SL 2 compatible viewers, and very, very chic and versatile!